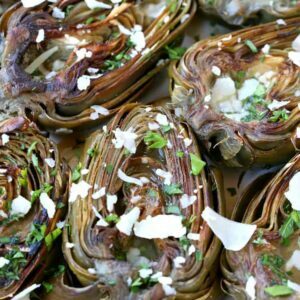 Try these Roasted Brown Butter Artichokes for a side dish, or vegetarian main meal that will make heads turn at the dinner table! 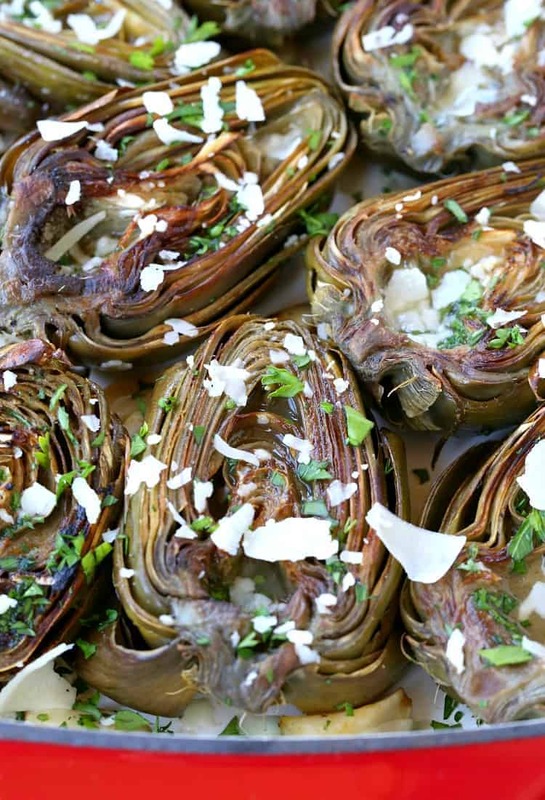 Not only do these artichokes look amazing, but they taste even better than they look. As a kid we had stuffed artichokes every Thanksgiving and sometimes on Christmas too, depending on what we were having that year. 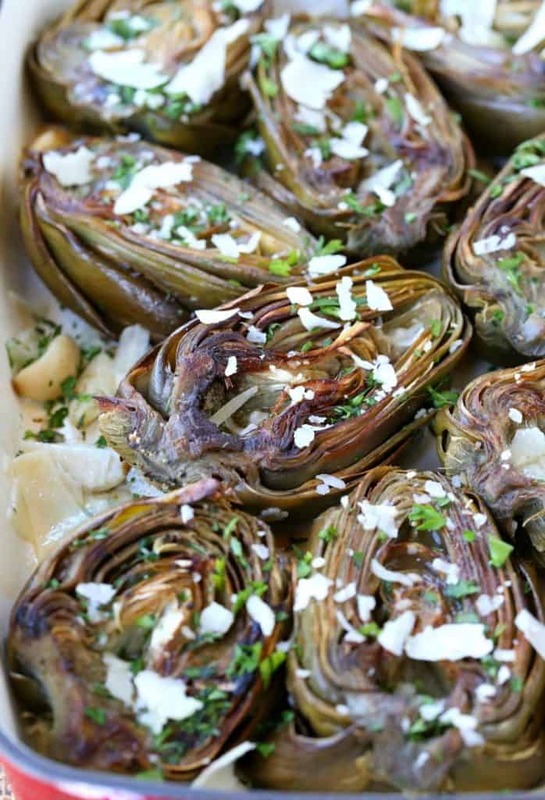 There’s even fried artichokes for appetizers…it’s an artichoke fest. But ALWAYS on thanksgiving. Doesn’t matter if my mom had to drive 30 minutes away to find the nicest looking artichokes and doesn’t matter how much they cost. They were – and still are – always on the table. I started liking them so much though that I wanted to have them more than just once a year. I want them with my steak dinner, or even a chicken dinner…or pasta works too. If you ask me, you could serve artichokes with almost any meal and I’d be OK with it. 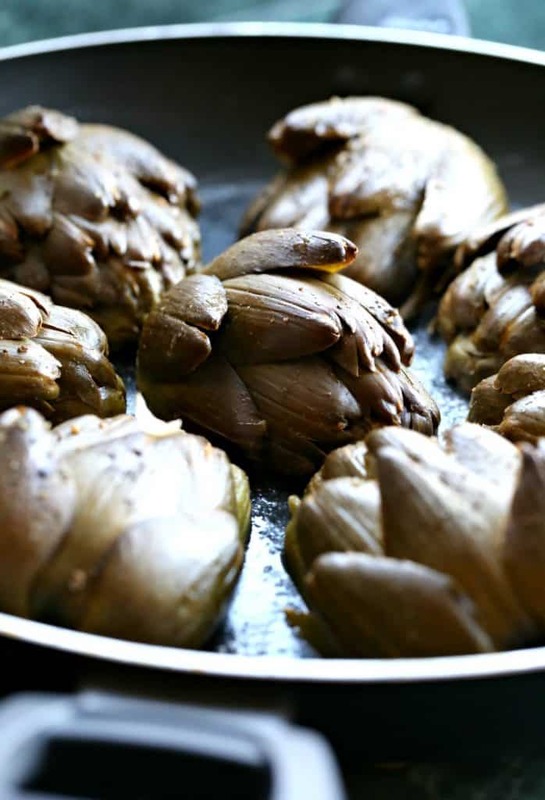 These Roasted Brown Butter Artichokes are a little different than the traditional way of steaming them in the pot but these will be done a lot quicker for you too since they’re cut in half and roasted at a high temperature. Don’t be afraid of the choke! 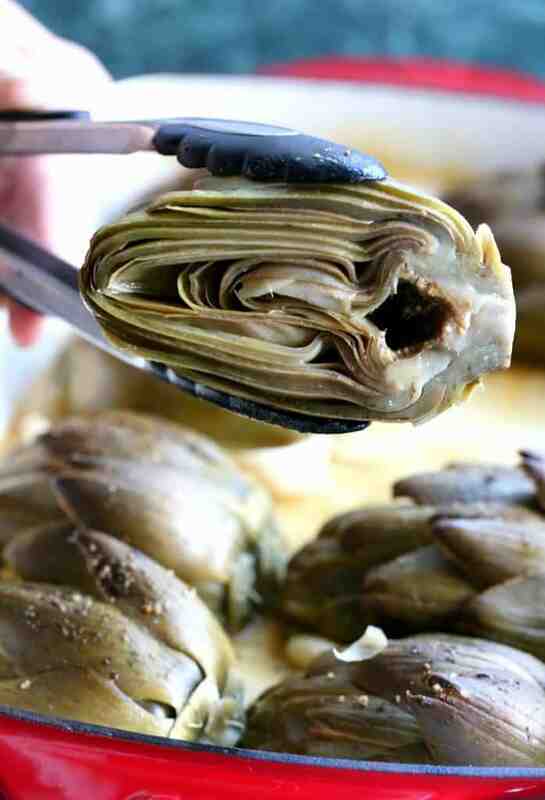 Some people I talk to are intimidated by artichokes…because of the dreaded choke! It’s no big deal guys, you just scoop it out. By cutting them in half first like in this recipe it’s actually a lot easer to do. Start off, like I said by cutting the artichokes in half. Take off some of the tougher outer leaves and get them in a bowl of water with lemon juice so they don’t brown up on you. 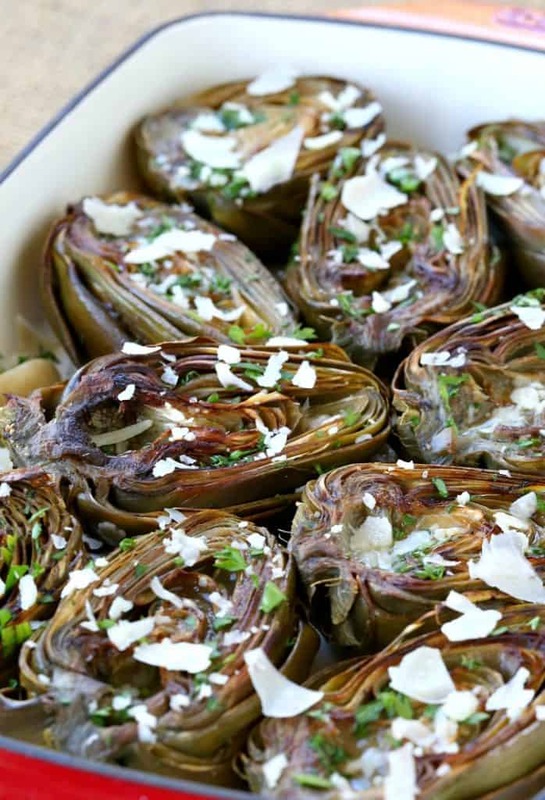 Add chicken broth, wine, butter and garlic – lots of garlic – to a baking dish, then add the artichokes in cut side down. Cover with foil and bake for 30 minutes. You can go crazy with the stuffing here, even add sausage and peppers if you want. But we’re going to keep this one simple today…no sausage involved if you can actually believe that one! When you take them out of the oven, test the stem with a toothpick to see if they’re tender. You don’t want mushy here, just tender enough to get a toothpick in and out. Now it’s time to brown up a little bit of butter in a skillet. Yeah I said a little…just a few tablespoons. OK four. Four tablespoons of butter will get these artichokes nice and crispy on the edges and totally soaked with butter. Once the butter melts and turns slightly brown, get the artichokes in, cut side down again, and let them sit for a good 5 minutes. Now it’s time to eat. 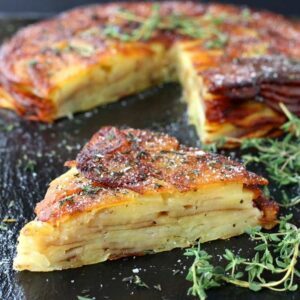 Add some shaved parmesan over the tops – now you can turn these babies over! 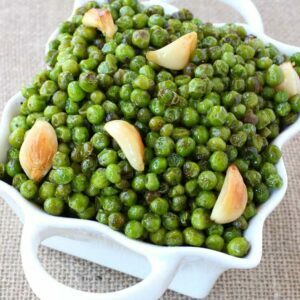 Sprinkle on chopped parsley and serve. And if there’s any butter left in the skillet I’d spoon that over the artichokes just to make sure you’re not wasting any. 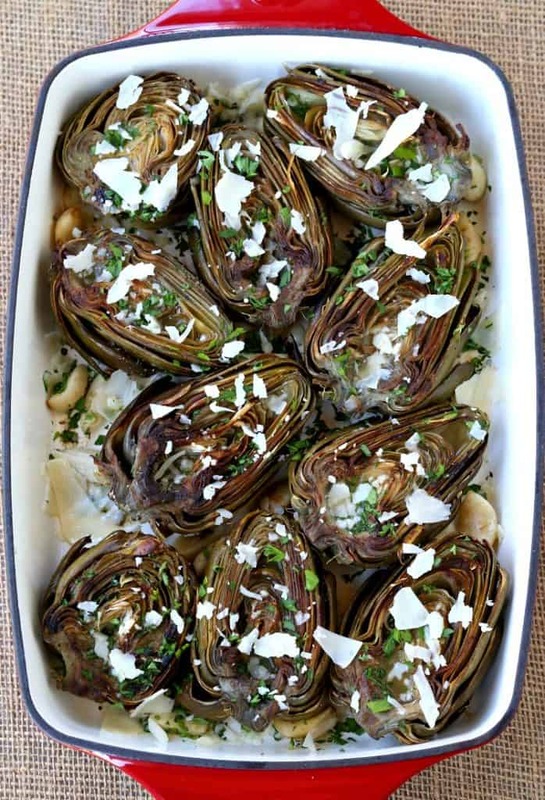 You can also use the broth left from the baking dish as a dipping sauce for the leaves – it’s hard to leave anything behind from these Roasted Brown Butter Artichokes! Trim the stems off the artichokes. Pull off the tough outer leaves and cut in half from the stem to the tip. Put the cut artichokes in a large bowl with lemon juice or cut lemons while you prep the rest. Pour the chicken broth and wine into an 11x 13 pan. Add the artichokes cut side down, then place in the garlic cloves and half of butter around the pan. Cook for 30 minutes, remove from the oven and carefully lift off the foil to release the steam. Test to see if the artichokes are done by inserting a knife or toothpick into the stem of the artichoke. In a large skillet, add the remaining butter and melt until bubbly and browned. Add the artichokes cut side down, draining any excess broth, and cook for 5 minutes over medium heat until the artichokes have browned. 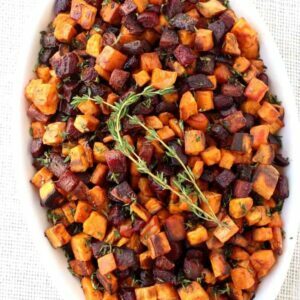 Remove to a serving platter and garnish with fresh chopped parsley and grated parmesan cheese. If you like at this point you can grind some more fresh pepper on top and give the artichokes a drizzle of olive oil – totally optional. Serve with broth for dipping.